Superdude Comics » Story of Samson: Samson and the Lion – bee-hold! 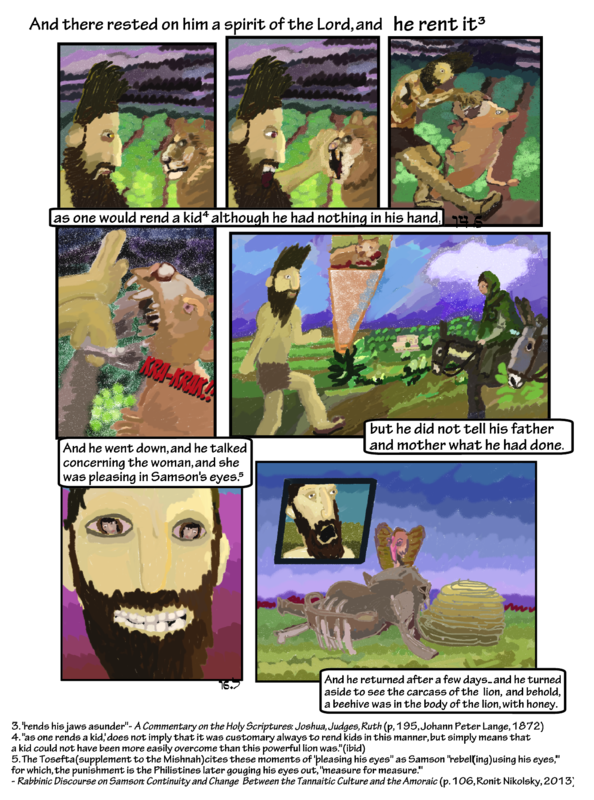 Story of Samson: Samson and the Lion – bee-hold! Notes: For centuries, the scene of Samson “rending” the mighty lion has captivated artists, particularly sculptors—and especially Renaissance sculptors who chiseled hyper-realistic Adonis-type physiques out of marble—who loved depicting Samson as caveman Hercules, a Biblical version of Hercules slaying the Nemean lion acceptable to (and readily $ponsored by) the noble houses of European Christendom. These Samsons, glorifying a distinctively unJewish Greco-Roman image of the male physique, are too numerous to list here… but one of the most famous is this one: Samson and the Lion by Cristoforo Stati (early 1600s). I did a lot of research on how to depict the fight with the lion, and everyone throughout art history (with few exceptions) has Samson attempting to separate the lion’s top and bottom jaws. I’m the first, as far as I know, to depict Samson snapping off the lion’s jaw-bone. Panel 5: wide angle landscape in the background with verdant orchards around a distant villa and a focus box and zoom panel highlighting the bloodied lion corpse at the vineyard’s edge, now far away from Samson, who strides toward his parents/their donkey transportation in the foreground. probably because contact with dead animals, and even moreso fresh-killing this lion barehanded, was violative of Nazirite restrictions in the extreme. Panel 7: 14.8 And he returned after a few days… and he turned aside to see the carcass of the lion, and behold, a beehive was in the body of the lion, with honey. Samson, shown from the neck up in a panel-within-a-panel, reacts with horrified shock to the primary scene, the graying lion’s carcass, partially decomposed with lower jaw detached and a beehive grown-up in the shadow of its upper jaw. Meanwhile, a pink vulture with goldish streaked brown wings pulls some lion corpse bwains for an opportunistic snack. I’m glad Samson is horrified, given what he does next. The Old Testament could be surreal at times.